The night is darkest just after the dawn. Years after Koba’s betrayal, the ape leader Caesar (Andy Serkis) and his nation of apes remain taking residence in the woods. Trying to live peacefully away from conflict, conflict finds them by way of The Colonel (Woody Harrelson). His assault on the apes’ home leaves massive casualties. Now out for revenge, Caesar, along with Maurice (Karin Konoval), Luca (Michael Adamthwaite), found hermit Bad Ape (Steve Zahn), and a young mute female straggler (Amiah Miller) embark on a journey to locate and eliminate The Colonel. The woods are no longer safe for apes, but a new location has been scouted and deemed livable. But, the war between apes and humans must reach a conclusion before the next chapter in ape evolution can begin. 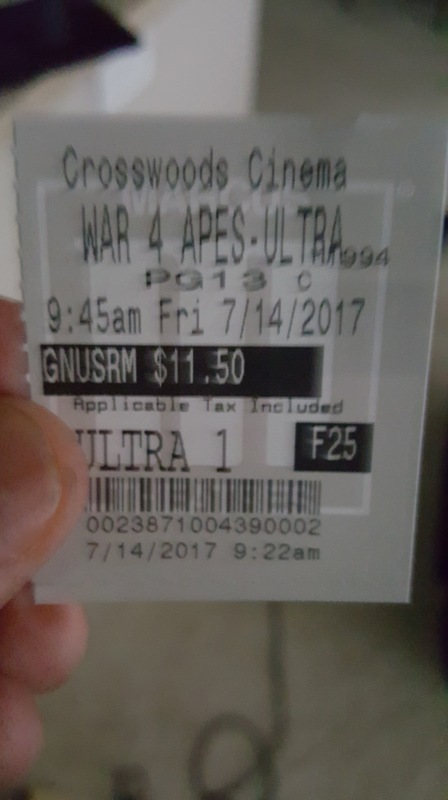 Who knew that in 2011 the dawn of the next great trilogy was beginning with Rise of the Planet of the Apes? Considered a middling IP at best after Tim Burton’s 2001 spin on things, Rise and Rupert Wyatt invigorated new life into the franchise. But, director Matt Reeves pushed it in places it’s never been before, both visually and thematically, with Dawn of the Planet of the Apes. He officially ties the bow neatly on this trilogy with War for the Planet of the Apes. Of course, it should go without saying at this point that the CGI, motion capture, rendering, and whatever else I’m probably forgetting on the technical side of this feature is absolutely impeccable. I’m saying it again because as spectacular Dawn was on that front, War takes it up multiple levels, proving that in three years technology evolves at an exponential rate. There are shots—extreme close up shots—of Caesar and his mains-in-command that are mind-blowing, and full of weight. Fear and loss play a huge part in this movie; the consternation is seen on many of the lead characters’ faces. The character arc of Caesar goes very deep, and Serkis does it all as the ape leader. His delivery of dialogue, as well as sign language and facials, is moving. Not to be shortchanged either are newcomer Steve Zahn, Michael Adamthwaite, and Karen Konoval. Woody Harrelson stands as the best human character the reboot has seen, his style being perfect for the military leader. Some of the best moments are devoid of any dialogue or even subtitles. Reeves opts to tell some of War for Apes completely visually. The sounds of composer Michael Giacchino go a long way in making this endeavor a success. In a cinema world in which seemingly every big studio is on the hunt for the next universe starter or continuation, War for the Planet of the Apes has no real aspirations to do so. One would be doing themselves a massive disservice by not watching the predecessors, but, it is cool that Reeves commences War with two-sentence recaps for newbies that summarizes everything newcomers need to know before seguieng into an impressive opening action sequence. War for Apes is a mostly cold and bleak affair, befitting of a predominately cool grey and blue color palette. That doesn’t make it any less of a technical masterpiece, though. War for Apes, like Dawn before it, uses its primates to hold a mirror to our own society. However, where Dawn was subtler in its approach, War goes a little more overt and obvious, lessening the impact and the thought-provoking themes ever so slightly. The war aspect of the title is present, but the war itself seems to be more metaphorical than literal. 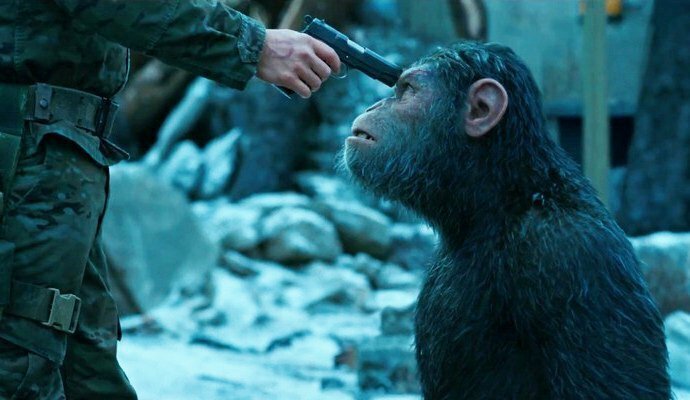 Do not go in expecting a prolonged blitzkrieg; War for Apes is emotional-drama first, action-blockbuster second. The last stand for Caesar and company caps off an amazing epic that will rank up there with the best trilogies in film history. This war closes the chapter between humans and apes, but won’t quickly be forgotten. Photo credits go to slashfilm.com, aceshowbiz.com, and digitalspy.com. Ugh. I still cannot believe I have yet to see Out of the Furnace. I definitely feel it’s a movie I’d enjoy. Might as well just blind buy it on Blu-Ray. Can’t wait to see your thoughts on this. Now this is more like it! After a pretty forgettable summer so far we’re getting to the business end with this, Dunkirk and Baby Driver. You have me highly anticipating this now mate! This past few weeks starting with Baby Driver is what we need! Hopefully Dunkirk delivers, and I think Atomic Blonde is gonna be a pure delight. Not to mention smaller indie stuff that is making wakes. Keep it coming Hollywood! Oh yeah, forgot about Atomic Blonde! We gave the same grade!! yay!! I walked into this screening kinda dreading what I might see as let’s face it, the movie season so far has been pretty bleak. Wow..was I in for a surprise. I loved this film. It was truly fantastic to me. Great review from you!!! I think it’s been better than last summer. Also, since June 30th and Baby Driver, we’ve been getting at least one good movie each weekend (Baby Driver, Spider-Man, War for Apes) and hopefully Dunkirk and Atomic Blonde deliver. And that’s not counting the smaller, independent-ish movies that are making some noise like The Big Sick and The Beguiled. But back to this. I’m just surprised this felt so fresh. If films like this continue (and they most surely will), it could definitely shift peoples’ perception about motion-capture performances and the enormous talent these actors have to possess. Great review! Absolutely. Problem is, I think these movies don’t just grow on trees lol. War for the Planet of the Apes is a visual stunner but a narrative bummer. I wasn’t captivated by the story, but yeah it looked so good. I was really impressed by the Mo-cap work. Same. It’s why I couldn’t get it to perfect, the narrative isn’t as captivating as, say, Dawn was, which was great and subtle in its tackling of themes. But, I do think this wraps Caesar’s story perfectly. And the mo-cap is obviously spectacular. I’ve technically seen this movie but I defer to your review. Aww thanks! What did you think? Nicely written review. You have me wanting to see it. You have to man! The great buzz is real. Maybe not as good as Dawn, but a perfect end to the trilogy. I really like the sound of it.